It is August, 1974, and a tightrope walker is running, dancing, leaping between the towers, suspended a quarter-mile in the sky. In the streets below, ordinary lives become extraordinary as award-winning novelist Colum McCann crafts this stunningly realized portrait of a city and its people. Corrigan, a radical young Irish monk, struggles with his own demons as he lives among prostitutes in the Bronx. A group of mothers, gathered in a Park Avenue apartment to mourn the sons who died in Vietnam, discovers how much divides them even in their grief. Further uptown, Tillie, a thirty-eight-year-old grandmother, turns tricks alongside her teenaged daughter, determined not only to take care of her “babies” but to prove her own worth. 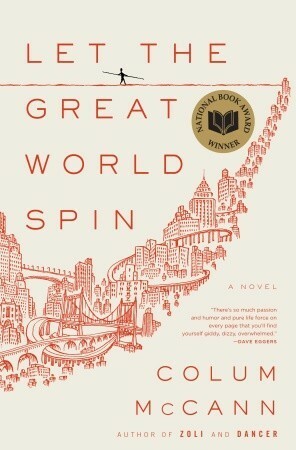 McCann’s most ambitious work to date, Let the Great World Spin is an unmistakable and triumphantly American masterpiece.